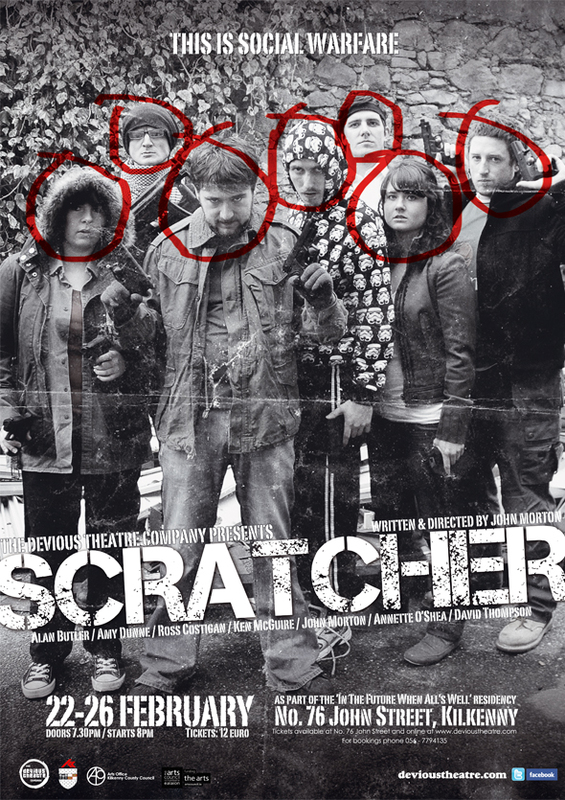 According to Devious, 'Scratcher is a dark, satirical comedy set in a social welfare office on a gloomy Tuesday morning as 6 unemployed people slowly begin to transform into a revolutionary outfit bent on holding the country hostage. Signing on has never been so fun. This is social warfare.' That sounds fun! It's written and directed by John Morton, and starring Alan Butler, Annette O'Shea, John Morton, Ross Costigan, David Thompson, Ken McGuire, and Amy Dunne. It's being performed in Dublin as part of THEATREclub's theatre festival The Theatre Machine Turns You On: Volume 2 on Thursday 17th February, (yes, the day after tomorrow) at the Project Arts Centre, and in Kilkenny from 22-26 February at the Arts Office, No. 76 John Street. You should come. I'm going. It's going to be great. Oh, and they've released a nice little promo video for their Scratcher performance in Dublin. It's basically a checklist of everything they're bringing with them. Y'know, guns and stuff. Lots of guns. And as we all know, guns = excitement and fun! And violence. But mostly fun. Chances are I could get arrested for this sort of talk... ah well. So... you should come. Yep. Besides, it's on in the mid-term, and you'll probably have nothing else to do. No offence. Oh, and just so you know... (Scratcher plugging ends here, so if you're not interested in anything else, then you might need to broaden your horizons a bit, and you might like to click here for Devious Theatre. It's a lovely website.) Anyway, just so you know, I feel that Apostrophe will, slowly but surely become a this-is-what-I'm-doing blog, a lot of which I have been reading recently, rather than a this-is-how-I-think-and-feel-about-things blog. Of course, it'll still be a blog where I feel and think about things, I can't not do that. I'll just be talking more about what I do be doing with my life. And this is my bridging sentence to my next paragraph. Here we are. On the topic of posting... Usually, my aim is to post something in between every Quote of the Week, but, and I don't want to seem whiny, but it's a lot of pressure, and if I have nothing to post about, I start posting silly 'fillers', which are basically rubbish. You and Apostrophe (Yes, I'm referring to Apostrophe as an actual living being) deserve better. So on 20th February, I will be posting Quote of the Week #43, my last. I'll be posting more than one quote, so if anyone wants to say something good in the comments, go ahead. As creepy as that sounds. And much as I would love to jet out to you and see it, it's a little far to go :) plus I'll be somewhere BIG. SHINY. AND APPLE SHAPED. Sure we might get you to do a guest blog or two on DTC or the residency blog now that you've got your hooks into Devious!